Take a look at our latest end-of-trip (EoT) project at 240 St Georges Tce, a premium office building in Perth’s CBD. Find out why everroll® rubber flooring is ideal for end-of-trip facilities. Supply suitable flooring for refurbishment project that incorporates new end-of-trip facilities within existing CBD office tower. Adhered to floor surface using specially formulated Regupol® two-part poly adhesive. Flooring installed by Peter Standish of Commercial Floor Covering Services WA. Why Everroll® for this project? A major consideration in EoT facilities is moisture from wet wheels and dripping sweat. The floor needs to be anti-slip. Everroll® Rubber is the perfect answer! Where cleats are permitted to be worn, 8mm thick everroll® is perfect for this purpose. 4mm thickness is adequate when cleats are not permitted to be worn. 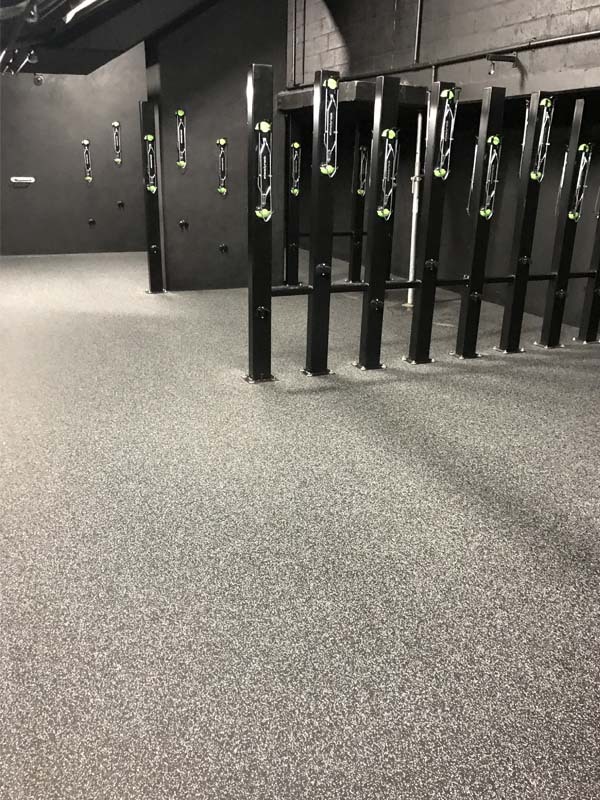 Everroll® rubber flooring does a great job of absorbing impact sound from cleats, but it also reduces the overall ambient sound generated by bike-rack mounts/dismounts and other associated noises. Everroll® flooring contains high percentages of post-consumer rubber, making it an environmentally sustainable choice. Pictured above is a six-star, green star rated building with everroll® installed in its EoT change rooms (145 Ann St, Brisbane). Read our blog post. Everroll® is a non-laminated homogeneous flooring product, meaning the surface wear layer is continuous for the whole life of the product. Everroll® has been tested in tough environments for over 20 years, and can even be used to protect walls, as pictured here in the 477 Pitt St project. Download the case study PDF for this project. Everroll® can even be used outside, as pictured here on the ramp that leads the EoT facilities for the new Woodside building in Perth (11 Mount St). Like the 145 Ann St building mentioned above, the new Woodside building is a six-star green star rated building. The installer for the Woodside ramp project was Malco Flooring. Read our blog post about this project. Read our blog post about EoT facilities or visit our everroll® product page for more details.